Borderlands 2's third Headhunter DLC pack, How Marcus Saved Mercenary Day, will released on December 17. Last month saw the release of Borderlands 2: The Horrible Hunger of the Ravenous Wattle Gobbler, a Thanksgiving-themed DLC for Gearbox's premier gun collection simulator. Naturally, now that people are starting to "get into the spirit", IGN has spilled the beans on Borderlands 2: How Marcus Saved Mercenary Day, a Christmas-themed DLC due out later this month. The DLC will hit Xbox 360, PlayStation 3, Mac, and PC on December 17 and set you back just $2.99. Like the previous headhunter packs, it will include a new mission as well as unlockable heads and skins for each character. How Marcus Saved Mercenary Day's exclusive mission takes the vault hunters to the town of Gingerton, in the snowy land of Frost Bottom, where Marcus asks them to investigate a train full of guns that's gone missing on its way to Gingerton. 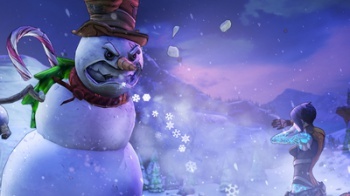 As you uncover the mystery of the missing "presents", you'll get ti battle the terrifying Mr. Tinder Snowflake, a Snowman boss character whose head you can claim for winning the fight. Unlike Ravenous Wattle Gobbler and TK Baha's Bloody Harvest, the unlockable head in How Marcus Saved Mercenary Day is completely unique for each of the game's six playable characters. Gearbox also teased that more Headhunter content was coming to Borderlands 2 in 2014.